Last Thursday, U.S. Customs and Border Protection (CBP), also called the Border Patrol, surrounded an Arizona facility with 15 trucks, 30 agents, and a helicopter, and arrested four migrants. The building they raided belongs to No More Deaths, a nonprofit whose mission is to provide water and medical aid to migrants crossing the desert. The nonprofit had an agreement with CBP that was supposed to allow them to work side by side in the same area. NMD does not assist migrants with transportation or logistics or try to influence which direction they go once they leave the medical facility; their mission is “to end death and suffering in the Mexico-U.S. borderlands through civil initiative.” They leave food, water, and supplies on migrant paths, provide emergency first aid, document abuse of detainees, help detainees through the court process, and help find missing migrants and their belongings. 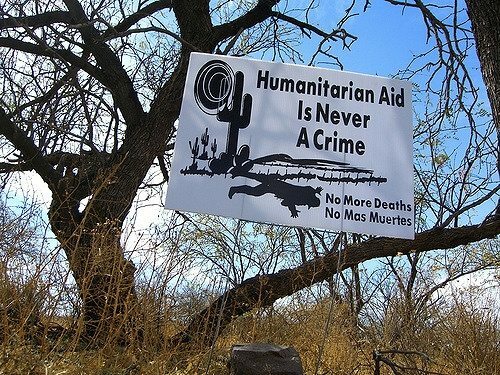 Since 2013 the Tucson Sector of the Border Patrol has had a written agreement with No More Deaths (NMD) that they will respect the NMD camp as a medical facility under the International Red Cross standards, which prohibit government interference with humanitarian-aid centers. That agreement now has been violated by the Border Patrol under the most suspicious circumstances. The Border Patrol acknowledged that they tracked a group for 18 miles, but only after the migrants sought medical treatment did the Border Patrol seek to arrest them. The choice to interdict these people only after they entered the No More Deaths camp is direct evidence that this was a direct attack on humanitarian aid. At the same time, the weather forecast is for record-setting deadly temperatures. Since the 9/11 attack on the United States, the U.S. border patrol has intensified dramatically. The number of agents has more than doubled, and the border fence has grown from 60 miles to 700 miles long. President Trump, a well-documented opponent of immigration reform, illegal immigration, and Mexican or South American immigrants entering or remaining in the country without legal status, has attempted to both lengthen the fence and add 15,000 more agents, which would bring the total to over 35,000. David Bier of the Cato Institute pointed out that “one byproduct of making it harder to enter is that people will choose to cross in increasingly dangerous points along the border.” Migrant deaths have increased 340 percent since 2000, to a ratio of one death per 1,269 apprehensions. By attempting to fix [immigration] through the building of an offensive and divisive wall, ramping up detention, threatening to ban refugees fleeing horrific violence, entangling local law enforcement in immigration matters, and creating deportation forces that will separate families who are part of our communities, President Trump is only cementing his place on the wrong side of common-sense, political realism and our American history.